This can't be good, can it? Discussion in 'MacBook Pro' started by AdamA9, Nov 1, 2014. Anyone know what this means and why it has come up? I did a usual Disk Verification but it couldn't be completed. If I do follow the instructions, is it going to cause me issues or can I go ahead and do this? It could be early signs of a hard drive failure. Hope you have a backup handy, if not, make one now. I'm all backed up to a TimeCapsule. I never leave the house with the laptop so it's always backed up. If I do the repair as it suggests, nothing bad will happen, right? I'll back up and give it a go but I don't want to get stuck in that boot screen. Been there before with an old iMac and took ages to fix. Well since you're backed up there isn't much risk. Simply understand that all hard drives eventually die. All of them. If disk utility deems you need to repair it, do so. But like I said, it could be early signs of a hard drive failure, or it could simply be some corrupted data giving DU a hard time. Either way, I'd be weary of that drive from now on. They like to fail when you least want them to. It's a new laptop though, only had it a few months so a little concerning it could be dying already. I have 3 year Apple warranty so should anything happen hopefully I'll be covered. I did the reboot and went thought the verification and repaid and it said everything seems to be okay, so not sure what to do now. Many have to book into Apple to see if they can figure it out. 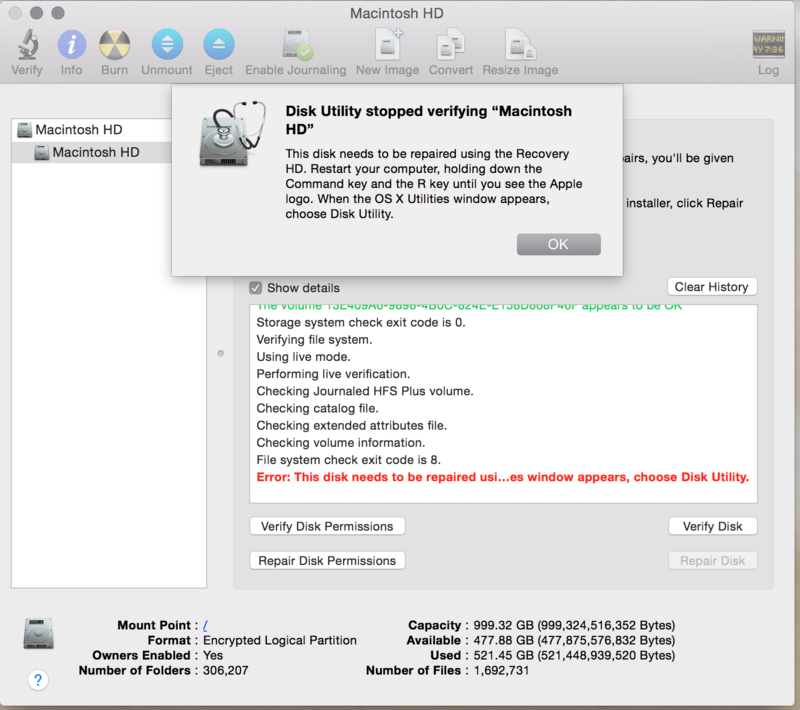 After seeing your post, I went ahead and ran the Disk Utility and had the same error. Ran the required repair as well and it repaired the issue and everything is showing up fine now. Bought my rMBP in Feb and I bought the Apple Care as well as a time capsule.